i can’t believe im blogging now! but.. yes i am..
Just did my toe nails.. finally removed my not very leopard prings’ leopard prings! oh well.. haha! still need MORE IMPROVEMENT!! i think i will need a real dotting tool SOON! and i think i found a little interest here.. hee! For this “not-so-leopard-prings” print, i had used L.A.Girl Matte Red (NL544) as base color, The Face Shop Gold lacquer (can’t recall the number) as the spot and an ‘unknow’ thin brush black lacquer as spot outline.. Dun ask mi how i get the print.. as u can see… its not very successful yet! i think u can try it out urself and u mite do btr!! ^__^ In case u are wondering y my matte color is so shinning, i used top coat! hahah! i used a matte red is not because i want a matter finish! but because tt’s the only RED i have at tt moment! lolx! Anyway, had bid goodbye to my leopard prings!! now say HI to my Crackle Toe!! This is much simpler!! Had used 2 base color here… OPI’s Planks A Lot (NL P16) and Sparrow Me The drama (NL P15), both are POC series! And of cuz MAIN STAR is my Crackle Overcoat (02-Vintage Violet) from Sally Hansen! 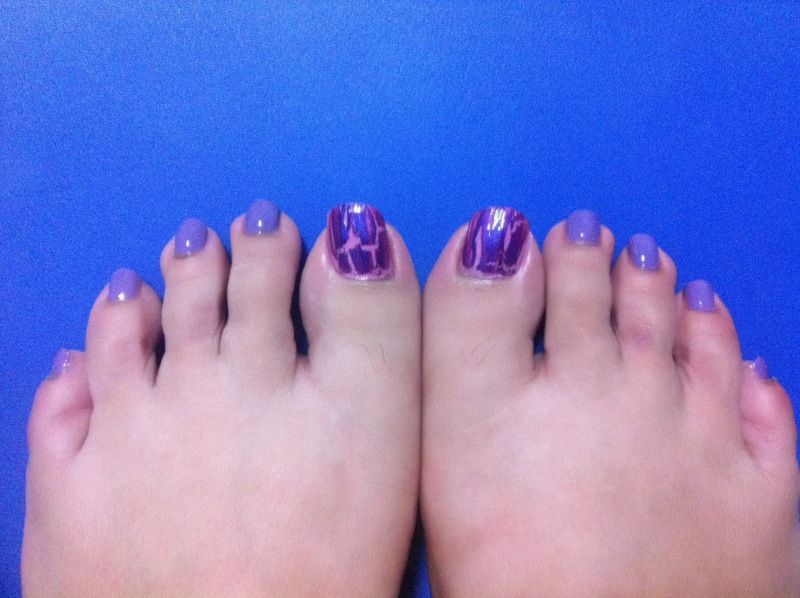 As my Crackle Overcoat is purple, so i decided to paint my big toe in PINK so that it can contrast my Crackle color! did it went well?? I think S.H.’s crackle Overcoat is still not available here.. or at least i have yet to seen one.. color not bad ya~? This entry was posted in .L.A. Girls, .OPI, .Sally Hansen (Nails), Matte Red NL544, Nail Art, P15 Sparrow Me the Drama, P16 Planks a Lot, Vintage Violet Crackle 02 by Tempted to Love. Bookmark the permalink.